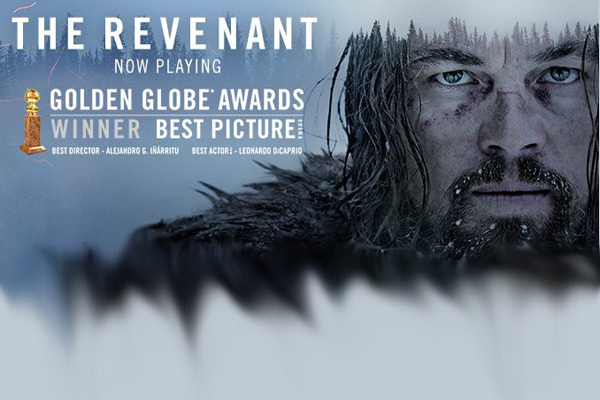 “The Revenant” has barely been out in movie theaters but it’s been receiving critical acclaim for weeks … months. Excellent reviews have been coming in about the performance of Leonardo DiCaprio and about the movie itself (the writing, the direction, the cinematography). So it’s no big surprise that the movie garnered numerous nominations for the recent Golden Globe Awards, and that it took home the Best Actor award for DiCaprio, Best Director award for Alejandro G. Iñárritu, and Best Motion Picture award for the movie itself. Unfortunately, I haven’t been impressed with the movie. I watched “The Revenant” recently (the day before theatrical release in the US) and … well, I do not agree with the critics. But then, what do I know? I’m not going to spoil the movie, but I will tell you a little about it so you know that you’re getting into when going to see it. The film is set in 1823 Montana and South Dakota and is (somewhat) based on a tale from the life of real-life frontiersman and fur-trapper Hugh Glass. The movie follows Glass as he attempts to lead a trapping party to safety after an Indian attack. Among the party is his half-Indian son. Glass is forced to survive injuries, attacks, and the weather, as well as emotional upheaval. It’s a gritty, mildly disturbing movie. Although the plot of the central story is somewhat unsurprising, there are some things I liked. The scenery is gorgeous; it was filmed mostly in Canada and Argentina. I’m told that there weren’t any (or hardly any) computer generated effects used, which is amazing when you look at the scenes depicted. DiCaprio has moments of utter brilliance in his man vs. nature quest to vengeance. Though the dialog was sparse (think “Gravity” in the snow instead of space), some of it seemed flat. Having said that … my friends loved the movie. They were actually shocked that I didn’t enjoy it. And I’m not really certain why I didn’t. I just know that the Golden Globe Award selection committee didn’t agree. Other Latino winners for the awards included Oscar Isaac for his role in the HBO miniseries “Show Me A Hero,” and Gael García Bernal for his performance in Amazon’s “Mozart in the Jungle.” Gina Rodriguez was nominated for “Jane the Virgin” but didn’t win (she won in 2015).